Released a year before John F. Kennedy was assassinated, The Manchurian Candidate held the title of Hollywood’s most paranoid political movie until… well, until Oliver Stone offered up the zillion conspiracy theories of JFK. The story, adapted from a 1959 novel by Richard Condon, ostensibly lampoons McCarthyism, providing one villain in the form of a buffoonish blowhard Senator, Johnny Iselin (James Gregory), who constantly announces that he possesses evidence of numerous Communist infiltrators in the Defense Department. Iselin is lying (and is a puppet, to boot), but in a sense, he’s right. It’s revealed early on that Communists are indeed plotting to overthrow the U.S. government, using a sleeper agent who was brainwashed in Manchuria during the Korean War, a decade earlier. The Manchurian Candidate tweaks our collective fear that the enemy looks exactly like us in much the same way that the original Invasion Of The Body Snatchers does, but with a political doomsday scenario foregrounded rather than (as in Siegel’s film) merely implied. Condon’s scenario isn’t necessarily partisan. The novel doesn’t specify which party Iselin and his wife/handler, Eleanor (Angela Lansbury), belong to, though the McCarthy resemblance clearly suggests the GOP; Jonathan Demme’s much less successful 2004 adaptation, starring Denzel Washington and Meryl Streep, made them Democrats. What matters is the chilling concept of good men co-opted for evil means against their will and without their knowledge. The movie, remarkably, often plays this as pitch-black comedy. Raymond Shaw (Laurence Harvey), the sleeper agent—who’s Eleanor’s son, and Iselin’s son-in-law—was widely despised in Korea by the soldiers under his command; it’s a running joke that while he’s been programmed to kill on command, the others, including hero Bennett Marco (Sinatra), have been programmed to consider Shaw “the kindest, bravest, warmest, most wonderful human being I’ve ever known in my life.” Marco, who suffers from nightmarish visions of his time in Manchuria, eventually works out the danger and sets out to stop Shaw from assassinating the unnamed party’s presidential nominee at their convention. 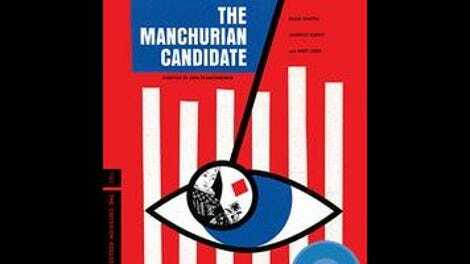 Surprisingly, The Manchurian Candidate joins the Criterion Collection next week as spine #803—it’s such a stone classic (at least since its high-profile 1988 re-release) that spine #20 sounds much more plausible. Director John Frankenheimer was operating at the peak of his considerable powers here, orchestrating one unforgettable set piece after another. The most visually complex is a press conference at which Iselin performs his “card-carrying Communists” routine, which Frankenheimer fragments across multiple TV monitors in the room while focusing “live” on puppetmaster Eleanor watching from the back of the room. But there’s also the gloriously surreal Manchuria sequence, which casually cuts back and forth between an objective view of the action—Chinese men bidding American soldiers to commit heinous acts—and what the brainwashed soldiers themselves see: a ladies’ garden party. For a movie with deadly serious subject matter, The Manchurian Candidate is often delectably insane, and never more so than when it introduces Janet Leigh as Rosie, Marco’s love interest, in a scene with dialogue that plays like Mad Libs. 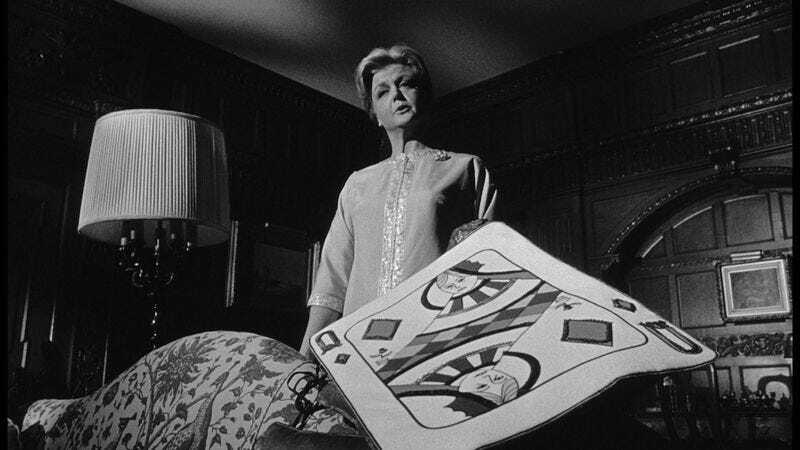 As wonderful and indelible as that particular scene is, it illustrates The Manchurian Candidate‘s one major weakness: a tendency to heighten its parts at the expense of the whole. After her meet-weird, Rosie gets virtually nothing of interest to do, spending the rest of the movie acting concerned in the manner of a totally generic girlfriend character. Similarly, the garden-club sequence, while creepily fun to watch, never quite makes sense in the larger context of the film, as Shaw willingly follows any orders, once he’s triggered, without needing to misperceive the nature of what he’s been asked to do. And that trigger itself—the Queen Of Diamonds, following the words “Why don’t you pass the time by playing a little solitaire?”—inspires a gargantuan coincidence in which Shaw’s beloved, Jocelyn (Leslie Parrish), shows up at a costume party dressed as that particular playing card, inadvertently making him susceptible to commands. Little cheats like that hold The Manchurian Candidate back from true greatness; at the same time, though, they’re the reason the film is still remembered and rewatched over a half-century later. If the parts are individually magnificent enough, maybe their integration into a satisfying whole doesn’t matter.